The merchandise trade data for June 2013 was released today. Exports for the month decreased by around 4.6% when compared to June last year, in dollar terms. It decreased by around 1.5% for Apr-June period of this year. So the start has not been good. The imports decreased for the month by around 0.37% when compared to June 2012. However, for the Apr-June period, the imports have increased by around 5.99% over last year, in dollar terms. 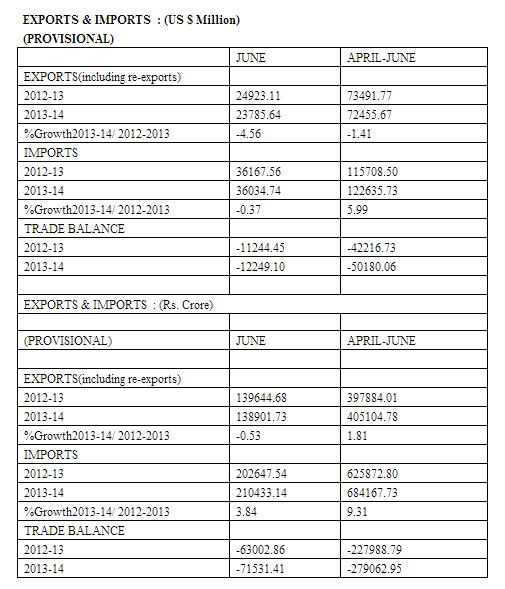 So, the trade deficit has widened this year, till now. It stands at around 50 Billion USD till now, compared to around 42 Billion USD last year. So, to sum up, the year has not been very good. I will discuss about some of the reasons, and potential solutions in coming posts. I had covered the Part 1 of chapter 3 of FTP of India, here. The first part covered the promotional measures run by the Department of Commerce. The second part here would cover the promotional measures being run by the Directorate General of Foreign Trade (DGFT). A small rejoinder is in order at this point. The promotional measures run by DGFT in this chapter are mostly the incentive schemes that directly benefit exporters. Most of these measures incentivise exports through what is called 'duty credit scrip'. The duty credit scrips can be used to pay customs duty for imports, pay central excise duties or to pay service taxes (from the current year). The duty credit scrip is usually a small percentage of the total value of exports. No direct cash is given as incentives under this chapter. Some of these duty credit scrips are of transferable nature, that is, they can be sold to a third party who can use them for the stated purpose of paying duties/taxes. In this way, the exporter can make money, if he finds that he cannot consume the duty credit scrips earned by exporting. Served from India Scheme (SFIS): The stated objective of this scheme is to accelerate growth in exports of services from India, so as to create a powerful 'served from India' brand across the world. The eligible services under this scheme are mentioned at this link. The amount of duty credit script provided is equal to 10% of net foreign exchange earned during the financial years. SFIS scrip is non transferable, except within group companies. This scrip can be used to import capital goods including office equipment, furniture, professional equipment, spares, vehicles that are used as professional equipment etc. Some musings on SFIS by me can be found here. Vishesh Krishi aur Gram Udyog Yojana (VKGUY): This translates to special agricultural and village industry scheme. (v) Other Products, as notified from time to time. The products currently eligible under this scheme can be viewed at this link. There are around 800 products listed under this scheme. The exports of these items are incentivised at the rate of 5% of the total export value (FOB=Free on board value). Focus Market Scheme (FMS): The stated objective of this scheme is to offset high freight cost and other externalities to select international markets, in order improve India's export competitiveness in these markets. This scheme helps to develop new markets where it would be difficult to reach without additional support. Once the markets are developed, the listed country can be taken off the list. This scheme has helped our exporters reach deeper African, Latin American countries, CIS and eastern European countries. Such diversification is important to reduce the dependence on US and EU. This list of countries/markets covered under this scheme can be found at this link. Exporters get a duty credit scrip of 3 to 4% of total value of exports. Certain type of exports such as services export, gems and jewelry exports etc are ineligible for the benefits. Focus Product Scheme (FPS): The stated objective of FPS is to promote exports of products which have high export intensity or employment potential. The incentive is provided to offset infrastructural inefficiencies and other related costs in marketing of these products. The list of eligible products and the associated value of credit scrip (from 2 to 7% of value of exports) can be found at this link. A hybrid scheme called Market Linked Focus Product Scheme (MLFPS), which is similar to above schemes of FMS/FPS is also administered by DGFT. The products and associated markets under this scheme can be found under Table 2 of this link. (e) SEHs and above shall be permitted to establish Export Warehouses, as per Dept. of Revenue guidelines. (f) For status holders, a decision on conferring of Accredited Client Program Status shall be communicated by Customs within 30 days from receipt of application with Customs. (g) As an option, for Premier Trading House (PTH), the average level of exports under EPCG Scheme shall be the arithmetic mean of export performance in last 5 years, instead of 3 years. (h) Status Holders of specified sectors shall be eligible for Status Holder Incentive Scrip. (i) Status Holders of Agri. Sector (Chapter 1 to 24 ) shall be eligible for Agri. Infrastructure Incentive Scrip under VKGUY. Agricultural Infrastructure Incentive Scrip (AIIS) is a scheme for status holders who export products that fall under chapter 1 to 24 of ITC-HS. A 10% scrip is given for import of capital goods involved in storage and transportation of these products. Status Holders Incentive Scrip (SHIS): The objective is to promote investment in upgradation of technology. A 1% duty credit scrip, over and above other incentives, is given under this scheme for status holders. The scrip is limited in transferability and can only be transferred to other status holder. This scheme has been discontinued since 2013. An exporter can claim only one of the above scrips and the schemes are thus exclusive. India's current account deficit(CAD) is hovering at uncomfortable levels, despite an improvement shown in data released last week. The merchandise trade deficit is around the range of 200 Billion USD annually, which contributes major portion to the CAD. The gap is managed by capital flows and trade in services. At such times, it is common to hear ideas to control trade deficit, and in turn, CAD. I totally endorse those ideas that talk about deeper reforms and focus on issues such as infrastructure (power, ports, roads etc) and capacity building of institutions (financial, executive, judicial, regulatory etc). I also agree with ideas on measures that control inflation and talk about fiscal prudence and tax reforms. Lack of deeper reforms, irresponsible fiscal policies and inflation is at the heart of today's CAD. In this post, I am going to talk about ideas other than these. Most of such 'other' ideas aim at import control, directly or indirectly. Such suggestions not only indicate dim understanding of international economics and trade, but also of history, especially of the times between first and second world wars when trade restrictions exacerbated the recovery of economies. The simplest of such ideas is to ban imports. If not ban all, then at-least non-essential imports such as luxury goods, Gold, toys etc. When it is pointed out that it is no longer permitted in globalized, WTO regulated world, the common retort is to suggest imposing quotas or tariffs on such goods. The rationale is that such high tariffs or quotas will limit the imports, while not hurting our exports. Sometimes poeple use quotas and tariffs interchangeably while arguing their case. There is difference in tariff and quota, as you can see in this post, but for now, let's assume that tariffs can have the same effect as quota, in decreasing imports, which is generally true. The problem also lies with the definition of non-essential goods. If one takes out Capital/Engineering goods, Petroleum products, Gems and jewels (as they are used in exports in turn), chemicals, pharma products and so on, we are left with only consumer electronics of certain types (smartphones, tablets, gizmos and such), imported luxury automobiles, toys and such that can be called non-essential. All these hardly add up to 20 Billion USD of imports in a a total of around 480 Billion USD of imports of India. You can see exact figures here. If we add Gold and Silver to it, we will get a respectable figure of around 80 Billion USD for control purposes. I am not sure if all Indians would agree to put Gold under non-essential imports, but let's assume so for the time being. The question is, how high a tariff would seriously decrease these imports. The answer is, it depends on the product's demand curve. The above products are generally price inelastic. A small hike might not stop an iPhone buyer from shelling out an extra 1000 rupees, nor would it deter a gold buyer from buying gold for marriage/savings. So the tariff increase has to be large. A large increase would now incentivize smugglers and duty evaders and Burma bazaars would thrive. Also, it would immediately attract retaliation from other WTO members, who might drag us to dispute panel at WTO, and simultaneously erect their own barriers against our exports. In addition, any such measure would be read by foreign investors as a sign of panic, and probable balance of payment crisis, leading to withdrawal of funds from India. Future investments would also come under question in a regime with lack of certainty of foreign trade policy. Assuming that the above import restriction manages to decrease targeted imports by 40%, we would save 32 Billion USD. However, the retaliation from other nations might bring down our exports by same number. Also the capital outflows might reduce the margin further. Of course, the last one might depreciate rupee further, leading to better exports in the long run, but in the short run, we will end up with worse CAD and potentially stare at default if things go seriously wrong. Economists are well aware of the J curve effect of currency depreciation in short run. The currency depreciation affecting balance of trade is given by Marshall-Lerner condition, which puts the weight on elasticity of import and export products. In a global economy of low demand, a price decrease of export products might not have intended effect, leading to inelastic behavior in exports. Also, we have an inelastic import basket in petroleum, gold etc. So our trade balance would deteriorate. Also, it is not that we export only to US against whom our currency has depreciated. Other currencies have also depreciated against USD recently and to expect our exports to pick up with countries other than US, due to currency depreciation is moot. The same would be the effect if we try to erect quotas. Also, quotas have this bad habit of benefiting the quota-grabbers, at the cost of govt revenue that tariff would have generated, unless quotas are rented out for revenue. This arrangement would be complex, retrograde, and might lead to scams in country like ours. Some might also propose that non-essential imports should be allowed only against a quota. The quota mechanism of the proposal was interesting. We might give some kind of import-license to exporters, commensurate to their export performance, as an incentive. This will be the allocated quota. The non-essential goods can be imported only against this quota. Exporters, in turn, would sell their quota in open market (or use it themselves) to importers who wish to import non-essential goods. When they sell it, they might do so for a premium. This would have two effects. First, it would act as an incentive for exporters, and second, it would act as an additional cost for importers of non-essential goods. So our exports will be boosted at the cost of imports. Though the idea looks attractive on the face due to the complexity of the mechanism involved, a closer reading would show that it suffers from the same pitfalls of an increased tariff. Retaliation, WTO disputes, market sentiment, and capital outflows apart, one can mathematically show that such ideas would hardly generate much change in the trade deficit given the nature of elasticity involved. In fact, there are very few studies linking export performance with incentives. In case of Gold, it is the seasonal fluctuations that play a major role and increasing tariffs hardly affect the imports. Also, a high tariff in gold will restart smuggling activities of 1980s. So, we go back to our argument in the previous paragraphs that this idea too is no good. It is not that one finds such ideas only here. Whenever a country faces difficulty, such ideas fly. US had its own protection related act during great depression where it increased tariffs on imports on over 20000 items. You can read more about it, here. However, it's difficult to enact such things today due to WTO. You can see how concerned WTO/UNCTAD sounds about the trade protectionist measures that has risen recently, here. I hope this post helps put few things in perspective for import control ideas. I had given the introduction to Foreign Trade Policy (FTP) of India, here. This post will concentrate on third chapter of FTP. The third chapter concentrates on the promotional measures in order to increase India's international trade. It focuses mainly on export promotion. Promotional measures are divided into two parts. First part pertains to those measures that are directly implemented by the Department of Commerce. The second part pertains to the incentive schemes implemented by Directorate General of Foreign Trade (DGFT). The objective of ASIDE scheme is to establish a mechanism for involving the State Governments to participate in funding of infrastructure critical for growth of exports by providing export performance linked financial assistance to them. The Scheme is administered by Department of Commerce (DoC). I had written an evaluation of this scheme sometime ago at this link. (ix) Assistance for contesting Anti Dumping litigations etc. The second similar promotional measure goes by the name Market Development Assistance (MDA). Under MDA Scheme, financial assistance is provided for a range of export promotion activities implemented by EPCs and Trade Promotion Organizations on the basis of approved annual action plans. The scheme is administered by DoC. Assistance includes, amongst others, participation in trade fairs, exhibitions, travel expenses for participating in such fairs, stall charges and so on. Department of commerce also identifies and encourages, through various promotional measures, certain towns which have shown exemplary export performance. Such towns are called Towns of Exports Excellence (TEE). There are around 27 such towns currently. In order to build the 'Made in India' brand, Department of Commerce also runs Indian Brand Equity Foundation, which started initially as a fund and is now working towards developing brand awareness for Indian exports in markets abroad. Apart from all above, Department of Commerce also allocates funds to national level institutions and Export promotion councils for trade promotion. One can get more details of all these schemes at the website of commerce department.